Morning. Is anyone trading today ? Missed a good short opportunity with EU. Expecting another clear signal to enter. Keep eyeing on what’s next for EU last day of the month. I also like to trade USDCAD mate. Looks like pair may going down. Better to close the trade with + pips. Ha ha Perry, Similar thing happened to me Cable. By the EU and GU may indicate reversal patter. I am not gonna long for the moment. Patience is the key. Have a lovely weekend guys. Thank you for the wake up call i will do brendad , and i will be i the plus. there is about 10 yard of euro expiring this week at 1.2500 so not too sure it s going to move much till Thursday. This is a new post I’ve written to help you with identifying high probability breakouts using 3 simple price action clues. Breakouts are some of the tougher environments for traders, and understandably so because they represent potential, but often fail. I’ve already written an article for trading breakouts Post-Breakout, but what about the Pre-Breakout moments where you have to make that key decision to trade it or not? How do you identify them and what are the key elements that precede strong breakouts? This is the key point of this article - to give you 3 tips for identifying a soon to be strong breakout so you don’t get trapped in a false breakout. 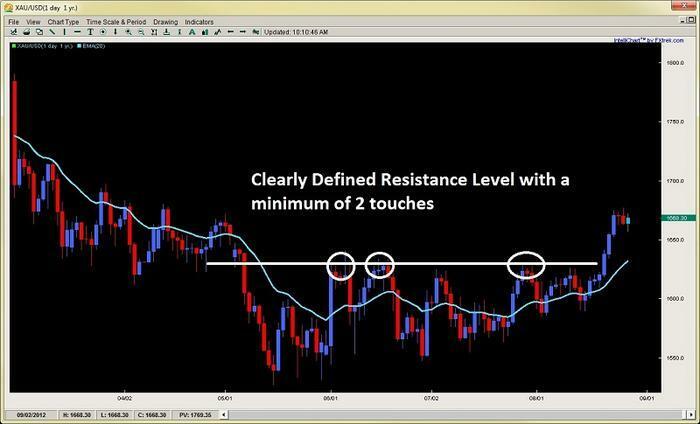 I will go over the three elements you will want to find before considering a breakout, then briefly highlight what is behind them from an order flow perspective. By learning to spot these clues, you can position yourself to trade higher probability breakouts and capture a larger portion of the upcoming move. The first pre-requisite to identifying a healthy pre-breakout situation is having a clearly defined barrier in the form of a support or resistance level. The classic case is when you have a trend in place (lets say uptrend) and then the price action runs into resistance at a key level. Ideally, you want there to be at least two touches on this level before defining it. The more horizontal and neater this level is - the better. But it should be noted, this is just a pre-requisite and generally by itself not enough to identify a healthy breakout setup. The reason for the two touches is to identify a sticking point where players are parked and what level they are defending that the (bulls in this case) are unable to penetrate. By finding both parties present, we have the environmental potential from an order flow perspective to create a healthy breakout. In this example, the sellers are clearly holding a price they want to defend and have stops just above it. By them staking their defense in a clear location, it communicates where their orders and stops are likely parked. It is tripping those stops, along with bringing in new buyers that is the goal of the bulls. 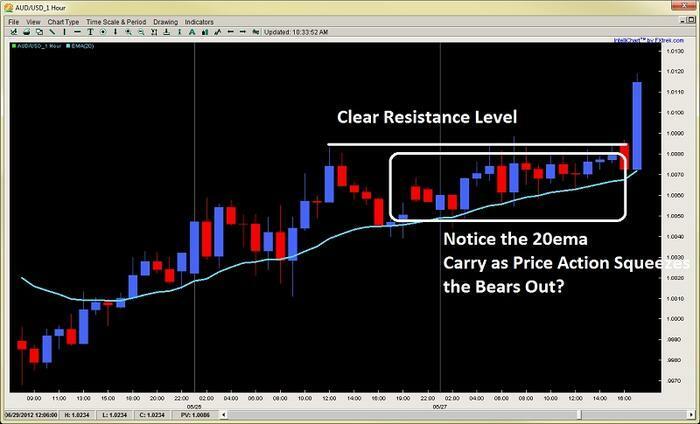 Below is an example of a clearly defined resistance level after a downtrend and consolidation period, communicating there are bears clearly defending a level. The second element you want present prior to a breakout is a pre-breakout pressure or tension that manifests as a squeeze. This pre-breakout tension is highly important because it creates a friction and pressure upon the defenders (in this case the bears). As the bears realize their rejections off a key level are getting smaller, while the bulls continue to gain more upside and territory, it causes a friction in their minds that forces them to make a critical decision (either stay in and defend, or exit the market). As the room gets smaller and smaller for them to work with as the bulls squeeze the bears out, sellers defending a level will often exit early, leaving the defense to those who are not realizing the game is up. This further weakens the defenses at these levels until very few are left to carry the burden. 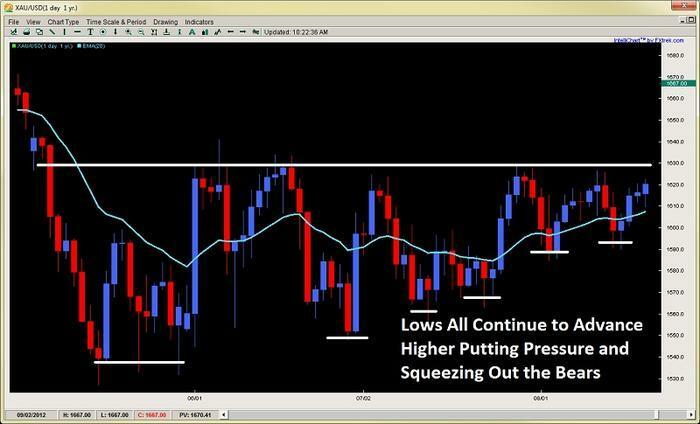 You can easily identify a price action squeeze and this pre-breakout pressure, or tension, by the price action forming higher lows in attacking a resistance level, or lower highs when attacking a support level. This is a combination of the current bulls willing to buy up the instrument at a worse price, along with new bulls wanting to get long before the breakout. A good example is presented in the same chart which I will zoom in on to highlight. Another key element you will find prior to breakouts is the 20ema begins to carry price leading up to the key resistance or support level that is being defended. This is not so much that traders are placing orders there prior to the breakout (although many will), but also a visual representation of how the squeeze is taking place. Just looking at the chart above, we can see in the beginning, after the first rejection off the key resistance level, price penetrated nicely below the 20ema. But as we get closer and closer towards the right where the squeeze is taking place, you see the market barely go below it for more than a single candle before resurfacing. Also, you will notice how the first few times the rejection approaches the 20ema, it breaks through after one candle. But towards the end many candles start to float above it where some traders are entering in anticipation of the breakout. Another really good example was one I traded and blogged about ahead of time with the AUD/USD on the 1hr time frame. The pair had been trending up for 110 pips over two days, but ran into a key resistance level that it got stuck on at 1.0081 (image below). Using the example above, notice how the 20ema in the middle of the chart is penetrated about 20pips, but then as we get closer and closer to the resistance level and the squeeze begins to happen, notice how the 20ema begins to carry the price action, and the penetrations get smaller and smaller? This is a combination of very few sellers defending the level, while the bulls in anticipation of a breakout (realizing they have control) are likely entering new positions to get in ahead of the upcoming breakout (I was one such trader). Eventually the pre-breakout pressure and tension became too intense and the bears gave up when the bulls made their push, tripping stops and creating a large breakout bar with a strong close. If you can learn to spot these key elements prior to a breakout, along with reading various other price action clues, you will find yourself entering in higher probability breakouts, increasing your success and profitability. You will also find yourself not getting trapped by false breakouts which can wreak havoc on your account and confidence in trading them. Thus it is critical to read and identify the key elements prior to a breakout. What happened to the trade ? I trade only majors. Not good at other pairs. My previous EU long didn’t work well. SL hit with 20 pips. But not bad for the week as Cable did the job for me with nearly 200 + pips. Closed 3/4 and gonna hold this trade till next week. Babypips recently did a Q&A with me about my trading, what new traders need to know, mentoring students and more. Very boring market. Like to short EU. But don’t like the current PA.